For those who follow trends in international development, the term “Girl Effect” is gaining increased footing as a term used in the common language. Briefly defined, the “Girl Effect” describes the human potential represented by the world’s 600 million adolescent girls. More and more studies demonstrate the widespread economic, health, and environmental benefits of educating this segment of the world’s population (see this website for some interesting global data on the “Girl Effect”). Yet in spite of this evidence, only 1% of international aid specifically targets adolescent girls. Anyone who visits Guatemala can see the country’s enormous potential. The flip side of that reality is that Guatemala is a country that is underperforming. This country has the hemisphere’s worst gender gap. 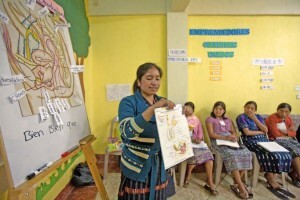 To be rural, indigenous and female in Guatemala is to be at the bottom of the social and economic spectrum. The irony is that it is precisely this demographic which is most capable of transforming this nation. 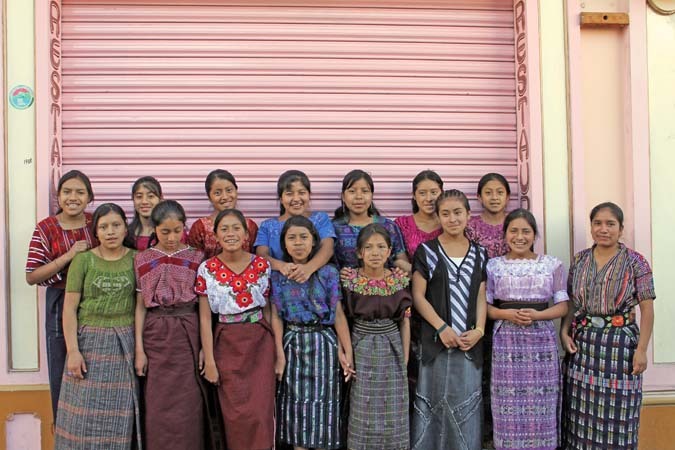 If these young women realize their human potential, Guatemala will too. But the term “Girl Effect” oversimplifies. To secure sustained secondary school access and success for a rurally-based, indigenous girl in Guatemala is to confront powerful economic, social, familial and structural obstacles. Money alone does not overcome these. Jeronima, the first young woman in her community to attend high school! A young woman named Jeronima personifies the “Girl Effect” and the amazing energy that can be unlocked to transform Guatemala. She lives in the rural village of Buena Vista in Sololá. Born into a Kachiquel-speaking family of 9 siblings (only 5 of whom survived), neither of Jeronima’s parents ever attended school. Like many indigenous children, Jeronima started her primary education late at age 9, and only learned to speak Spanish at school. She stopped her studies again in middle school when her local facility failed to offer the 9th grade due to a lack of demand. When the school finally opened that grade, Jeronima’s family had lost momentum and enthusiasm for her studies. The “double burden” of girls’ education (increased school-related costs + sacrifice of her being away at school/studying instead of working or doing domestic chores) was just too heavy. 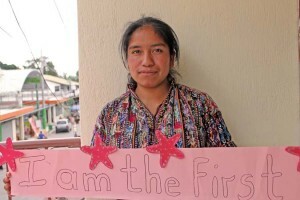 Starfish One by One found Jeronima and provided her with a partial scholarship that secured her access to high school. But as the first young woman in her community to attend high school, the economic issue was only one of several challenges. Jeronima had to travel by pickup to the city of Sololá to attend high school, she had to walk through her village in the more modern school uniform (pleated/plaid skirt instead of her indigenous traje) and endure the catcalls of other youths. Her older brothers were adamantly opposed to the idea of her going to school, and her father passed away leaving the family in a precarious financial situation. Often, it all seemed way too much to endure. But she was not alone. The essence of the Starfish program is human relationships. Jeronima joined a group of 14 other young women in the Starfish program to create a forma group. Through weekly meetings facilitated by a Starfish mentor, this group became a powerful source of emotional support for her. These groups stay together from the 7-12th grade, and become a compelling counter force to all the outside pressures that otherwise derail a young woman’s aspiration for an empowered future. The critical component of these groups is the mentor, who is a full-time staff person. Coming from the same region of Guatemala and speaking the indigenous dialect, she is among the less than 1% of Guatemalan indigenous women to reach university. Most importantly, she is empathetic to each young woman in the group. The mentor walks the 15-member peer group through the Starfish Empowerment Curriculum. Through this process, Jeronima learned financial literacy, reproductive health, IT skills, and crucial critical thinking and leadership abilities. Last year, Jeronima put into practice these new skills when she launched a literacy campaign for the mothers in her community. Jeronima graduated from high school last fall – the first female in her community to ever do so. She joined the Starfish team as a mentor, and is now walking 15 young women down the very same path she recently blazed. As mentor, Jeronima is responsible for keeping families both motivated and informed with a constant strengths-based focus. She is receiving training on how to prevent and treat situations of family violence. She is also charged with monitoring each of her 15 girls’ progress in school. On weekends, Jeronima is attending university, majoring in social work. Jeronima reflects what Starfish is doing for 214 students in Sololá and Suchitepéquez. This quality-over-quantity approach works: 95% of the students in Starfish are successful in school and graduate. 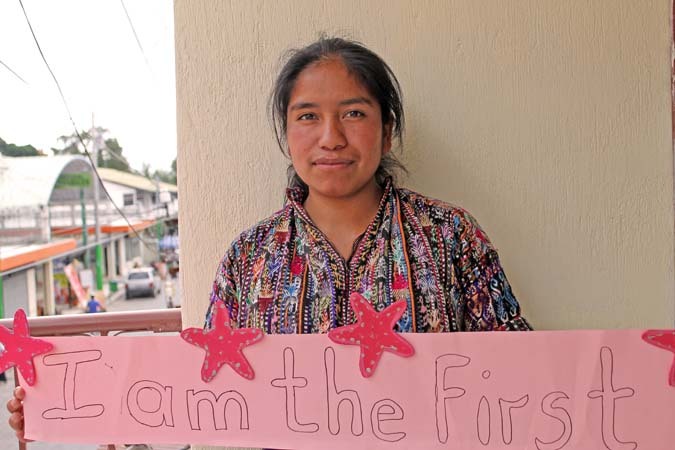 Through focusing on individuals and their personal ecosystem (family, school, peers), Starfish is unlocking the talents of a generation of positive change-makers in some of Guatemala’s most marginalized villages. This effectiveness and overall success is attributed largely to the extremely positive partnerships that Starfish shares with other Guatemalan and international organizations that continually enrich the program. Starfish returns the favor by sharing its success with other organizations through its RIPPLE program. This program focuses on sharing practice-proven techniques with other like-focused programs. This entry was posted in Guest Blog Posts, Health, Heart Song, Indigenous Life, Volunteering, Women's Work and tagged Contributions of women, daily life, indigenous culture, Maya, Personal Strengthening, Perspective, Volunteer. Bookmark the permalink.